We see ourselves as partners with our customers. All challenges, with the objective to deliver retreads at the quality level of brand new tires for the consumer, we approach together with our customers. Therefore are, internal continuous improvement and striving for a zero defect production, important components. True to the motto "Stagnation means regression" we always try to improve our processes, products and services to meet the customer requirements. This is based on feedback from customers and employees, the evaluation of performance indicators and process data, and the review of our processes through regular audits. It is our aim to identify and exhaust all potentials for improvements to clearly set us apart from our competitors on the market by excellent quality and performance. 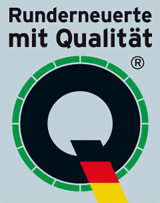 Therefore it is natural for us to certify our Quality Management System according to ISO 9001, to provide products and services that fulfill or exceed the expectations of our customers.